Nairobi’s population has increased more than tenfold in the last 50 years. This rapid urbanization brought with it a two-tier development process where some areas are rapidly modernizing while others lag behind. The provision of basic services often follows the split. Different geographic areas of Nairobi enjoy different levels of development and access to public services. Delivery of clean water and sanitation, waste management, access to electricity, emergency services, and law enforcement, to name a few, vary throughout the city. Some areas enjoy uninterrupted coverage while other have scarce or no coverage at all. The difference in quantity and quality of service delivery can be, among other things, attributed to the difference in the income levels of the residents, their ability or willingness to pay for services, and the government’s commitment to serve some and underserve other areas. Anyone familiar with Nairobi can attest that there are significant differences between areas such as Kileleshwa, Westlands and Kilimani on one side and Eastleigh, Mathare or Kibera on the other. The former areas enjoy almost full coverage of public services while the latter have few services. Areas that are denied access to basic public services – intentionally or unintentionally – face unequal economic opportunities, and, subsequently, economic exclusion. Some scholars argue, that “market- and non-market-related forms of discrimination directly affect poverty but also exacerbate it indirectly by reducing economic growth.” Further, income inequality can have significant impact on economic growth of the countries. Unequal access to services fuels the inequalities within the city, empowering some, and preventing others to escape the perpetuating cycle of poverty. We are specifically interested in how are services distributed in informal settlements. Does provision of public services vary within an individual informal settlement? 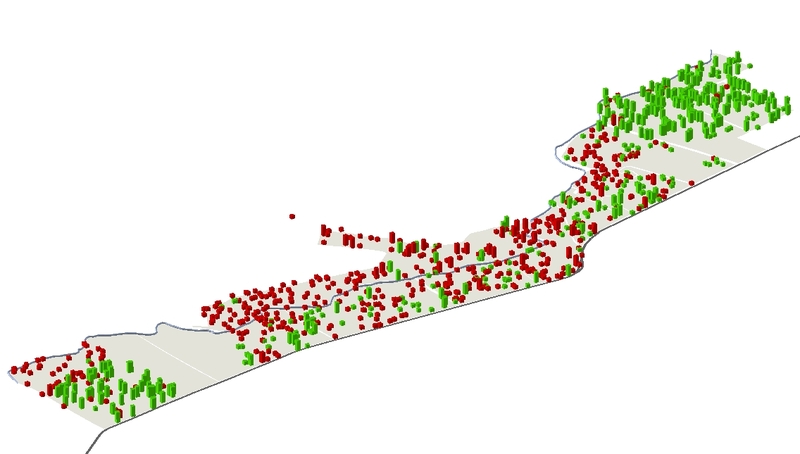 Using Spatial Collective’s household survey and GPS data we tried to answer this question by looking at geographic distribution of waste management and ICT services within a single locality – informal settlement of Mathare. We find that there are significant disparities in waste collection and ICT coverage even within an individual informal settlement. For example, in areas of Mathare that are relatively prosperous, residents enjoy mostly reliable trash collection, while other economically challenged areas have no trash collection at all. More specifically, most people who live in high-rise and brick buildings, which are associated with higher quality housing, pay for trash collection, while most people who live in tin-shack and mud-hut structures don’t. The type of housing can be thought of as a proxy for the family’s income because higher quality housing also means higher rents and improved access to – mostly payable – services. The map below displays the distribution of people who either pay or don’t pay for trash collection. Green color of the rectangular parallelepiped (let’s call it cubicle) represents a household that pays for trash collection while the red color represents a household that doesn’t. At the same time, the size of the cubicle represents either more (larger cubicle) or less permanent (smaller cubicle) buildings. We can see that majority of people who live in more permanent buildings pay for trash collection while majority of people who live in less permanent don’t (Maps at the end of the blog post depict access to services for more and less permanent buildings separately). Next, let’s consider what at first seems like a totally unrelated variable: levels of access to ICTs in Mathare, more specifically, Internet and smart-phone penetrations. In 2014, the International Telecommunication Union issued a report stating that by the end of the year there will be almost as many mobile-cellular telephone subscriptions as people in the world. At the same time there will be almost 3 billion Internet users with mobile-broadband subscriptions reaching 2.3 billion globally. This increase in growth is mostly due to growth in the developing world. Safaricom, Kenya’s leading mobile operator, reports that 67 percent of mobile phones sold in 2014 were smart-phones. Our survey shows the smart-phone penetration in Mahtare close to 40%. Additionally, there are nearly 3 billion Internet users around the World (40% penetration rate). According to some estimation, Internet access in Kenya is 37% and according to our survey, 38% of the people surveyed in Mathare had access to the Internet. However, despite these relatively high numbers, our research reveals that there are significant disparities in Internet access and smart-phone ownership between the areas of higher and lower quality housing in Mathare. This of course parallels our findings concerning waste management. 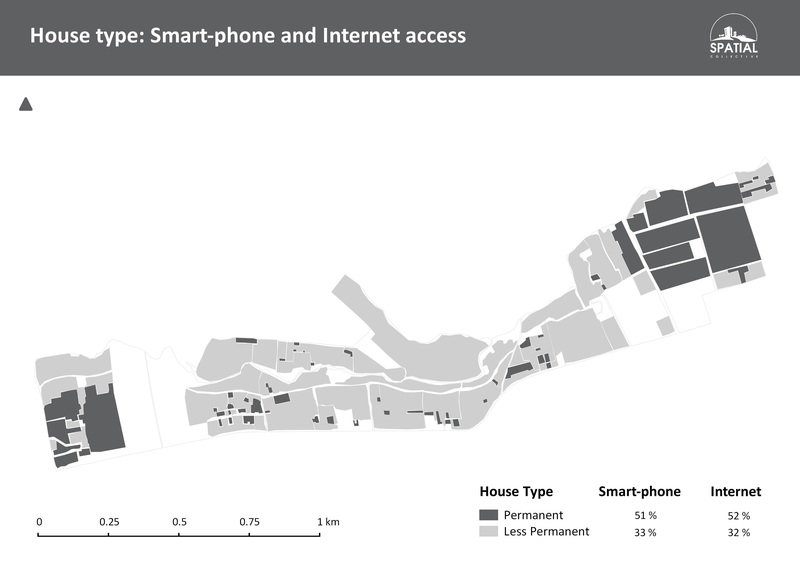 As we can see on the map below, 52% of the households associated with higher income of residents (more permanent housing) had access to the Internet and 51% owned a smart-phone. At the same time only 33% of the households associated with lower incomes of residents (less permanent housing) had access to the Internet and only 32% owned a smart-phone. The data points to the correlation between the type of housing (level of income) and accessibility of ICTs. Interestingly, the data also points to the correlation between smart-phone ownership and Internet access (this is a topic for a different blog). How can we interpret these numbers? The differences seem to depict the disparity in terms of access to services between different income areas of the slum and the city. Households with greater income have greater access to services as compared to households with lower income. Some might say that from an economic perspective, this phenomenon points to the basic free market ideology where people who pay for services receive them while people who don’t pay for services (mostly because they can’t) don’t. Others might argue that this is a failure of governance capacity by the state, that when the government fails to provide even the most basic services, the ill-equipped informal sector takes over and creates a sort of informal free market with disastrous results for some people. Whatever the case the poorest and the most marginalized seem to be on the losing end. Why do we think this is important in the first place? We believe that this is important because when we consider development policies which target marginalized communities we have to take into account their social and economic differences. Failure to do so can amplify those differences. Our research underscores the necessity of sound social research in slum communities. Too often an outsiders come into these marginalized communities and start implementing programs that fail to differentiate resident’s status and means. Poorly prepared development initiatives can lead to an increase in inequality and greater disparity between people. For example, the fact that people in certain areas cannot afford to pay for trash removal means that we need to show a certain level of pragmatism when it comes to solving the problems of waste management in those areas. Policies which cut across populations of different economic or social backgrounds might result in excluding some and empowering others, increasing disparities between people. Additionally, if we consider access to ICTs, the fact that not all of the people have equal access to information can mean different levels of public participation, meaning, thatthe potential effects of ICT enabled collective action must recognize that while mobile phones are common, smart phones are less so (though rapidly rising). Acknowledging that these differences exist and identifying the underlying causes should help inform our future policy decisions in order to create a more inclusive society. 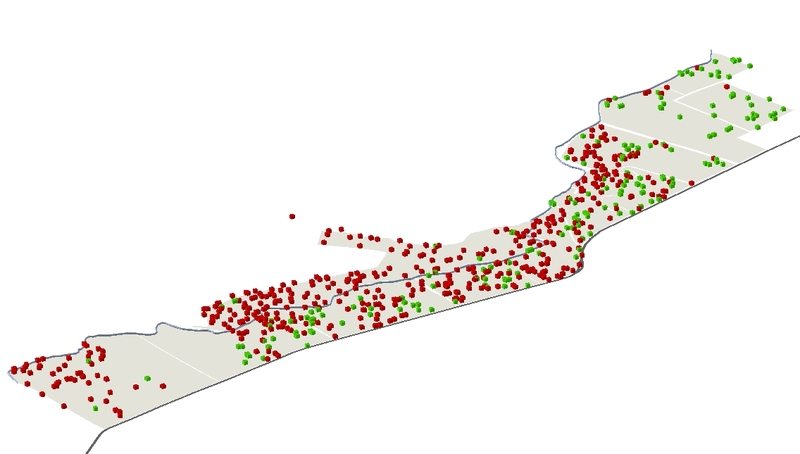 The maps below show households who pay for trash removal for more and less permanent buildings separately. We can see that majority of people in more permanent buildings pay for trash removal while most people in less permanent buildings don’t.